I’ve been busy reading books, thus not a whole lot new visually to show on this blog. The latest finished works are more political and politically incorrect. I myself don’t find them obscene, and many who would are supporters of war, torture, hunting animals from helicopters and killing them unnecessarily, and exploiting the earth and the working people for their personal gain. Still, I want to keep this blog more portfolio friendly and thus need to create another alter-ego for these pieces. But as I said, I’ve been busy reading. One book I am struggling through is Mark Twain’s Autobiography. Struggling isn’t the right word, I’ve given up for now. Stella sums up my feelings on it nicely. I devoured hundreds of pages of a variety of books and love Mark Twain, but the Autobiography isn’t the most exhilarating read. You should check out Haruki Murakami, a master of abstract storytelling, or The Corner, an account of the lives of those living in one of the open air-drug markets in ’90s West Baltimore. Peace. 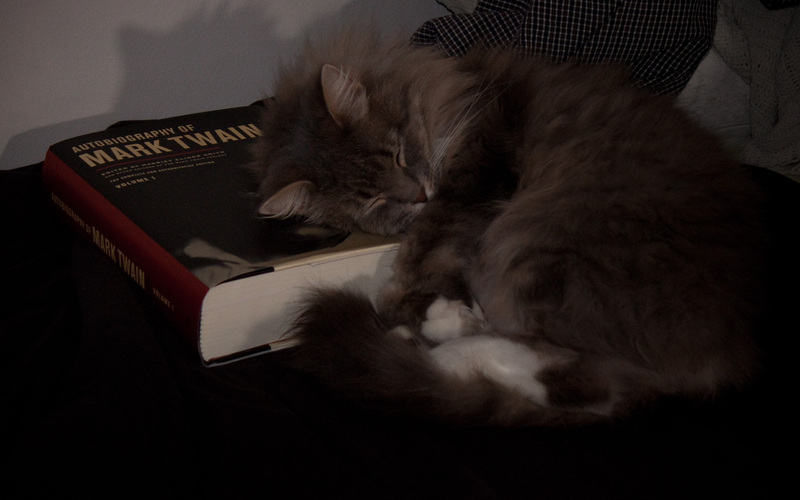 This entry was posted on February 10, 2011 at 4:40 am and is filed under Photos with tags books, Cats, felines, mark twain, sleep. You can follow any responses to this entry through the RSS 2.0 feed. You can leave a response, or trackback from your own site.